Austin, TX, March 15, 2016 – PSA Security and System Surveyor today announced that they have entered into a partnership to offer System Surveyor through the PSA Security Network. System Surveyor is a Mobile app and Cloud-based tool that simplifies the design, installation and maintenance of electronic security systems. The partnership provides PSA integrators with a breakthrough, innovative tool that reduces system design time by up to 50% and improves the efficiency of ongoing system life cycle maintenance resulting in better customer service and higher margins. 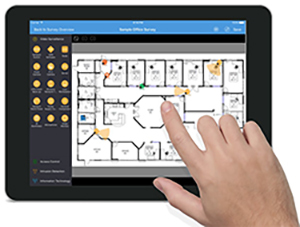 System Surveyor’s intuitive iPad-based Mobile app and Cloud Workspace provides system integrators with the ability to collect detailed survey and design information; capture, annotate, and associate photos to floorplan design elements; collaborate with technicians and project managers; and securely access plans back at their office. The all-in-one tool allows for more efficient design, maintenance and an established, accessible system of record. PSA Network is the world’s largest electronic security cooperative, owned by the most progressive security integrators throughout North America who are responsible for over $2 billion annually in security, fire and life safety installations. System Surveyor simplifies the design, installation and lifecycle maintenance of electronic security systems and IT assets. The result is improved quality and accuracy of system design, faster implementations, better system reliability, lower total cost of ownership (TCO), and reduced project risk. The award-winning System Surveyor app is available for download on the iPad at the App Store. Basic subscription is free and Professional and Team subscriptions are available for enhanced functionality. System Surveyor is based in Austin, Texas and can be found at http://www.SystemSurveyor.com.